Tim Ferriss, the #1 New York Times best-selling author of The 4-Hour Workweek, shares the ultimate choose-your-own-adventure book―a compilation of tools, tactics, and habits from 130+ of the world's top performers. From iconic entrepreneurs to elite athletes, from artists to billionaire investors, their short profiles can help you answer life's most challenging questions, achieve extraordinary results, and transform your life. what you want is a better set of questions. most natural shape of yourself as a writer and start doing that. interest, may take you places that being driven will never take you to. My own life has been shaped by happy coincidences. I am huge fan of Tim. This was the most dissapointing book I have read by him. I'm writing this as constructive feedback. Tim wrote this as an instruction manual. You are supposed to find an actionable nugget on every page, from some of the best people in the world. But I feel cheated of value. He basically sent out an email to hundreds of successful people, asking them the same questions. Reading this is the equivilant of reading hundreds of emails. As hurried as the responses are, you are trying to read it even more hurriedly. The one thing there is of value, is that Tim has sorted out what he feels is important. But unlike his "Tools of Titan" (which is one of the most valuable books you can have in your bookshelf), the informations is shallow. There is too much knowledge, shallow and without context, which makes most of these pages useless. I like the Tools of Titans format, since it is more of Tim's distillied notes and higlights. It is obvious he spent a lot more time on it, than this one. I would LOVE more books from Tim. But the format should be different. Knowledge needs to be organized more effectively to have any value. There should be a way to go deeper also, and not just swim on the surface on a ton of ideas. It's probably not possible to do psychoterapy on each individual, but please, Tim. More depth than breadth. I hope this was insightful in any way. It was my first review, because I want Tim to get feedback if it can help him in any way. This is easily my least favorite of Tim's books. I own all of his books published up till now, listen to his podcasts, get his "5 Bullet Friday" emails, etc., so I should be giving this a 5 star review since as you can see I'm a fanboy, but I feel like I would be doing an injustice to people looking to pick this one up. The last couple of books from Tim have been following the 80-20 principle he so much believes in: Basically do the smallest amount of work that bring the biggest return. This worked out pretty well for Tools of Titans. That book is full of gems of wisdom, though I was slightly annoyed that it was basically just Cliff notes from his podcasts, which I already listen to religiously. For this new book however, this strategy worked out rather poorly in my opinion. For one, the information just doesn't feel that valuable to me. As Tim pointed out in his introduction, these are busy people that took probably 5-10 minutes to hammer out an email. The old principle still applies here: You get back what you put in. Not much was put in here, so it doesn't surprise me that not much was returned. Some of it is ok, some of the advice is cliché, other stuff is somewhat useless (weird habit: top ramen for upset stomach; best purchase under $100: a spatula). Every few sections there is a page with "Quotes I'm Pondering" which is just regurgitated content from Tim's 5 Bullet Friday emails, another easy way to add a 'little' value to the book. This book is basically attempting to do what Tools of Titans has already done, but with way less valuable content. Kind of like that awesome blockbuster movie you saw that they made a lame, half-baked sequel to. 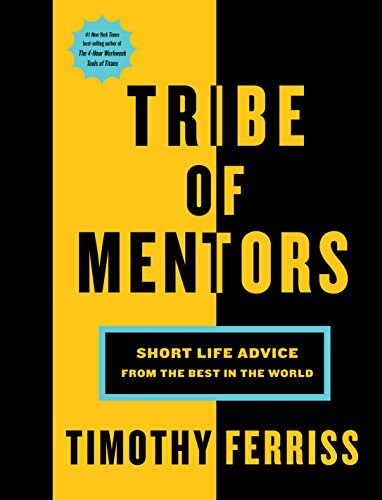 Neil Strauss, author and bestie of Tim’s, mentioned in one of his subscribed emails that Tim came to him for advice on how to write a best-selling book that “wouldn’t take years off his life” and that’s how Tribe of Mentors came to be. So we can confirm lazy writing is Tim’s strategy as of late. I’m really hoping after this Tim will go back to writing a REAL book like The 4 Hour Chef or The 4 Hour Body, which feel like a lot of work went into them. Perhaps that’s not something Tim is willing to do anymore, I don’t know. I see a lot more negative reviews here, which is hopeful for changing the future, even though the average is still 4.5 stars or so. I think a lot of us owe Tim a big thank you for breaking new ground in a world of huckster motivational speakers on the endless book and seminar circuit. But Tribe unwittingly exposes the dark side of Tim’s contradictions. Perhaps a very long conversation with Nassim Taleb about integrity and reputation-seeking would be his next best retreat. The fascination with Hollywood and stardom and constantly introducing people as “billionaire” and “‘New York Times’ Bestselling Author” etc. suddenly hit me as so...unseemly...missing the cosmic point altogether. He often grazes near the truth but then feints away, rarely grabbing the truth by the lapels and hauling it forth with brass and cojones. He did the dirty work of sycophancy to launch himself and great ideas and many of the right people into the stratosphere. Seems time to end the compromises. 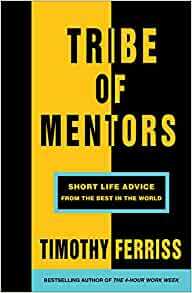 This is the backdrop to a book which lionizes the likes of Sorkin and Sharapova, not just for their savant-like talents, but as “mentors”. Good grief. Ah, the old Tools of Titans profiles of everyday brilliant heroes profiled elsewhere like P. Attia, R. Patrick, D. D'agostino, N. Ravikant, W. Hof; C. Sommer and P. Tsatsouline...real, complete, true people - also Gabi and Laird come to mind - who are true mentors in action, word and bravery...thank you again Tim for that. But now with Tribe we see many others who have reaped far too much pathological adoration already, too many money whores and power whores who deign to preach to us plebes, and too few everyday heroes who are truly humbling, inspiring, and unsung. The Twitter and Facebook people? Good grief, enough. Lean out and push some new boundaries and please...speak truth to power already, rather than the opposite. Save Ferriss...evolve Tim, evolve!